After breakfast you will depart for Jodhpur by surface (approx. 285 kms/ 5hrs). On arrival in Jodhpur you will check in Hotel. 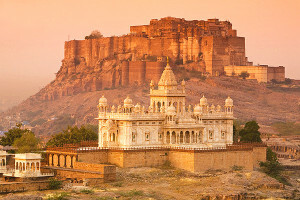 Afternoon depart for local sightseeing of Jodhpur visiting, Mehrangarh fort, Jaswant Thada & Umaid Bhawan Palace. 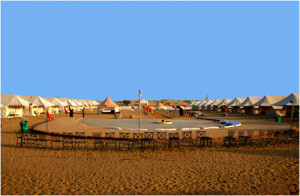 Evening will be at your leisure or free for shopping in the market of Jodhpur. Dinner at hotel. Overnight at the hotel. After breakfast you will proceed for mount Abu by surface (approx. 250 Kms/ 5hrs. ).On arrival in Mount Abu you will check inn at your hotel. Day will be at your leisure. Dinner at hotel. Overnight at the hotel. After breakfast you will proceed for a full day sightseeing tour of Mount Abu visiting viewing Gurushikhar, Arguda Devi Temple, Brahamkumari Ashram and the famous Dilwara Temples carved in marble. Evening will be your leisure. Dinner at hotel. Overnight at the hotel. After Breakfast you will depart for Udaipur enroute visiting the Ranakpur temple by surface approx. 280 kms / 6hrs. Afternoon arrives in Udaipur & you will check in at your hotel. Evening will be at your leisure or free for shopping. Dinner & Overnight at the hotel. Morning Depart for Chittaurgarh by Surface (approx. 150 Kms/3 hrs.). Sightseeing in Chittaurgarh. Train for Indore at 11:00 Pm. Train Class 3Ac. 3Ac. 2 Ac.